Let me tell you about something I did for my wife Jamy while she was away. 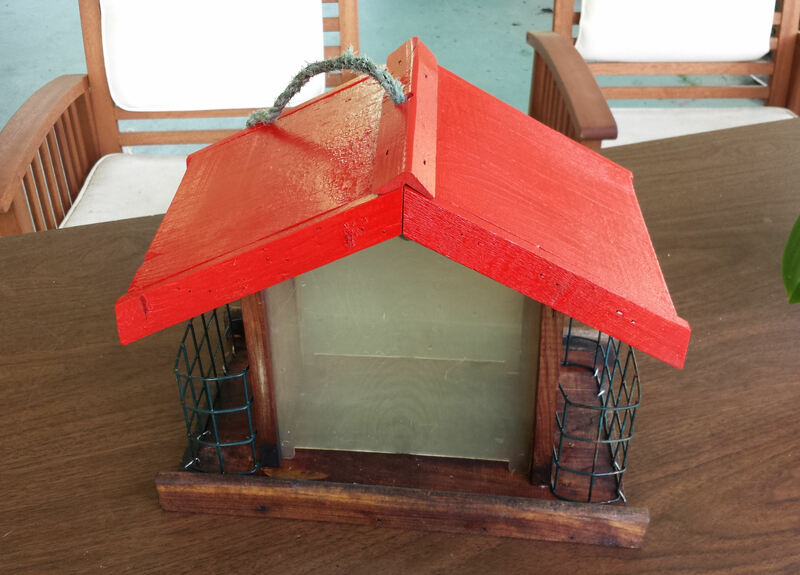 A few years ago she bought a wooden bird feeder, a simple thing stapled together and it had battery operated Christmas lights stapled around the roof. It stood a long time on a pole in the front yard. Eventually the lights stopped working. The squirrels would occasionally circumnavigate the baffle hanging above it and pounce on the bird feeder to eat the seeds and suet as squirrels are wont to do. So after a few years it began to fall apart. Jamy is a Master Naturalist, and spends quite a lot of time in the forest, in state and national parks all over the Florida. Before she left for another one of her road trips she asked me to repair it. I dismantled, soaked and scrubbed the pieces in the sink, and then I sprayed bleach on them and set them out to dry. The bird feeder had windows on the front and back, and I put these in the dishwasher. When the pieces were dry I glued the sides to the bottom and reset the staples. I used a few more staples to securely attach the suet baskets to the sides. When the glue had dried, I gave the whole thing, except for the roof, a coat of mineral oil, and set it out in the sun, so the oil would soak into the wood. While that was happening I took the roof, and attempted to replace the batteries for the blinking lights, but it was no use, they would not work. So I removed the staples holding the lights and unscrewed the little battery box and threw them away. I cleaned the roof in the same manner I had cleaned the rest of the bird feeder and when it had dried, I coated the underside of the roof with some mineral oil. Then I put it on a large piece of cardboard and I sprayed the top of the roof with a couple of coats of paint, candy apple red. So it looks pretty good and I imagine it will be hanging out in front of the house for a few more years. I could have bought a similar bird house for twenty dollars, and I could say that I didn’t want to spend the money, but I did it because I love her and I wanted to please her. I do a lot of things like that just to please her, and they do please her more or less. It is what you do when you have the time and are with someone and want them to let you know you care, and of course you hope that they will reciprocate. But it seems to me that this is what makes marriage different from the casual or even the ongoing affair. As you live together, each mundane act whether as isolated as the mending of a bird feeder or as routine as taking out the trash or doing the laundry becomes an act of love done for the other person. These opportunities occur nowhere else, it seems to me, but where the two live together as man and wife. This entry was posted in Essays and tagged bird feeder, husband, husband and wife, Jamy Sue Rose, Louis William Rose, marriage, relationships, servant. Bookmark the permalink.